SALINAS, California – May 4, 2015 – Saturday’s Continental Tire SportsCar Challenge race at Mazda Raceway Laguna Seca had a little bit of everything that makes road racing great. When the checkered fell after two and a half hours of competition around the challenging, 2.238-mile, 11-turn road course, only 0.836 of a second separated the top three cars. 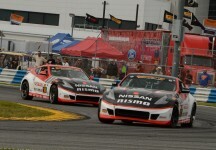 Nissan fans were happy because that third car was Doran Racing’s #14 Nissan 370Z co-driven by Brad Jaeger and B.J. Zacharias and advertising Nissan’s popular GT Academy. Zacharias was only 0.284 of a second behind the Mustang that finished second. The timing of pit stops to generate good track position, management of tire wear, fuel consumption, avoiding accidents, the timing of full-course cautions, the nimbleness and light weight of the Nissan 370Z and plain old hard driving all played a role in the Lebanon, Ohio-based team’s first podium finish of the year. It duplicated Jaeger and Zacharias’ third-place finish here in 2013, but it was even harder fought. Jaeger qualified seventh but he was already fifth by the end of the first lap of the race, partly due to an incident involving the team’s #41 shared by Nissan GT Academy winners Nick McMillen and Steven Doherty. Jaeger, of Charlottesville, Va., was still firmly in fifth place when team owner Kevin Doran brought the car in for its first pit stop on lap 14 under the race’s second full-course caution. Jaeger dropped to 12th in the Grand Sport class and 34th overall after that pit stop, but he quickly and carefully made his way through the Street Tuner field and was tenth in the GS class by lap 19. He passed both Rob Ecklin Jr. and Mark Boden on lap 22 to rise to eighth, and two laps later he set the entry’s fastest lap of the race with a time of 1:37.344. He passed Marc Miller’s Porsche for seventh on lap 26. Two laps after that he passed Scott Maxwell in the Mustang that would eventually finish second with a nifty move going into Turn 5. Jaeger then passed Ashley Freiberg’s BMW on lap 33 a minute past the 1-hour mark to move back into fifth. Polesitter Matt Bell led the race until he pitted on lap 40 with 1:16 to go, and at the same time Jaeger passed Austin Cindric for third place. That gave the lead to Hugh Plumb for a moment, but Plumb pitted on lap 41 to vault Jaeger into second place at the halfway point. He was 2.673 seconds behind the leader, Andrew Davis, at the time. Jaeger cut that to 0.4 of a second in the ensuing laps. Both Davis and Jaeger made their second pit stop under green on lap 51 with less than an hour remaining, where the battle for first and second transferred to one between the two cars’ pit crews. Both cars took on four Continental tires, fuel and did a driver change. The driver who was third, Hugh Plumb, pitted at the same time but he only took on fuel and swapped the controls over to his brother Matt. Davis’s #6 Camaro, now with Robin Liddell at the controls, was fourth after the pit stop, while Zacharias was sixth in the Doran #14. Zacharias, of Cincinnati, was nearly 5 seconds behind the fifth-place driver, Matt Plumb, at that time. He had cut that to only 1.1 second when an Aston Martin stopped at the exit of Turn 6 to bring out the third full-course caution on lap 60, mere moments after Liddell passed Jade Buford for third. Since they’d already made their second pit stops, the #6 and the #14 were able to rise in the standings when some of the other cars in the lead pack made their second stop under that yellow. There were only 35 minutes remaining in the race when the green waved again on lap 63. Lawson Aschenbach was leading in the pole-winning Camaro, Liddell was second, Plumb was third, Zacharias was fourth and Tyler McQuarrie was fifth. The top two cars were fielded by the same team, and it was evident their drivers would work together to keep Plumb and Zacharias at bay. Zacharias was right on Plumb’s rear bumper, however, determined to get around Plumb so he could fight for the lead. Zacharias got by Plumb on lap 69 going through the famous Corkscrew to nail down third place with 25 minutes remaining in the race. Liddell had fresher tires than Aschenbach did, so Liddell passed Aschenbach on lap 70 in order to protect the top spot from Zacharias’ attack. Zacharias was having none of it. When Aschenbach paused just a millisecond while passing a Porsche Cayman ST car working lap 71, Zacharias seized the opportunity and jumped by him and into second place with 22 minutes remaining. Behind them, Billy Johnson had even fresher tires on his Mustang, and he passed Matt Plumb for third on the following lap. Zacharias was two-tenths of a second faster than the leader, Liddell, at that point, but his momentum was slowed when Glenn Nixon’s Mini flew into a gravel trap off Turn 11 to bring out the fourth and final full-course caution on lap 74 with 17 minutes remaining. The Nissan’s strength is shown in long green-flag runs, as the car’s nimbleness helps its tire wear, and that ill-fated caution didn’t help Zacharias’s cause. Only 12 minutes remained in the race on the last restart on lap 76. Instead of fighting Liddell for the lead, Zacharias had to go on the defensive because Johnson was doing his best to pass him. Their battle let Liddell get a bit of an advantage, and Johnson’s fresher rubber allowed him to pass Zacharias for second place in Turn 11 on lap 80 with just six minutes to go. Zacharias continued to fight but time ran out and he brought the Nissan 370Z home in third place behind Liddell’s Camaro and Johnson’s Mustang. Plumb’s Porsche was fourth to make it four different manufacturers in the top four positions. Mike McGovern was fifth in another Mustang. Ironically the second-place Mustang played a major role in the experience the Doran #41 had in this event. McMillen, of Salem, Ore., qualified fifth but he tangled with that Mustang, driven by Maxwell at the time, on the exit of Turn 4 on the first lap and dropped to 18th in class and 44th overall. He was forced to pit to replace a flat tire, but the Doran Racing crew got him back on track without losing a lap, although he lost a lot of track position. McMillen set his car’s fastest race lap on lap three with a 1:37.156 while he was in 17th place, but that was the fourth-fastest lap of anyone in the race in the early going. McMillen started to pick cars off and the first two yellow flags helped his effort. He had worked his way back up to ninth when he pitted under the second full-course caution. Unfortunately the car wouldn’t start when McMillen tried to pull out of the pits, and efforts to get it going with a portable battery didn’t work. The team pulled the car behind the wall to replace its alternator. Although both McMillen and later Doherty did get to complete more laps they were out of contention by that point, and they ended up 17th in the Grand Sport class. They completed 61 laps to the winner’s 84. Doherty, of Plainfield, Ill., was making his first start in the class and his first start with Doran Racing, while McMillan was making his first start ever at Mazda Raceway Laguna Seca. The race will be televised on Fox Sports 1 at 9 a.m. Eastern on Sunday, May 17. The next CTSCC event is June 27-28 at Watkins Glen International in Watkins Glen, N.Y.
Additional information is available on DoranRacing.com and the team’s Facebook page. The series’ Web site is at imsa.com. Brad Jaeger: “The Nissan 370Z does so well here. We kept the tires underneath us. If it would have stayed green I think we would have won. But we’re spraying champagne anyway with third, so that’s good! “The whole race was amazing. We were so close to getting our first win. If it would have stayed green, Liddell’s tires were starting to fall off and B.J. was in a good position. But Johnson had fresher tires and that yellow allowed Liddell to cool his tires down. “Doran Racing had a great strategy; Kevin was so on top of it and making great calls. Sometimes the cards fall in your favor and sometimes they don’t, but we were so close! “It was relatively easy for me to get around some of the Mustangs. Overall we were running quicker laps, but I had to pick the spots on the track to pass them and make sure I turned the car over to B.J. in good shape. With the BMW we were a little more equal and it wasn’t quite as easy to pick her off, but once I got around her I pulled away. B.J. Zacharias: “Brad Jaeger had an amazing stint. He was a little disappointed with his qualifying, but I just tried to reiterate that the race was the more important battle. He drove very smart and clean, and put in a solid 90-minute performance. “Kevin Doran and Mike Luttrell made a great call in bringing Brad in under the first yellow about 25 minutes in. Then when we pitted with 1 hour remaining we could go the distance on fuel. After that it was just trying to be consistent and not abuse the tires. “We were able to come back through the field and reeled in the leader. I think we just didn’t need the last caution. Once that came out it let the Mustang bunch up, and it had much fresher tires. I was able to hold him off for awhile, but the newer tires they took made a huge difference. Nick McMillen: “We started off pretty well in the first few corners. I was battling with the 15 Mustang. He got ahead of me in Turn 4. He pushed me wide and I don’t know exactly what happened but we touched as we were exiting Turn 4 and we went off. I think our wheels touched. Anyway, I got a flat right-front tire. “We got that replaced, and the car drove great actually, even after the contact. “Then the low battery voltage was coming on. It seemed to be holding up OK, so I kept pushing. I think I was up to ninth. We had the pace to keep pushing forward. “I pitted right behind Brad, and the car died while we were changing tires. It just wouldn’t start. We pushed it in the pits, and decided the problem was with the alternator. “They replaced it, but we were many laps down, so I went back out and just tried to run clean laps. Then Steve went out, and then we lost the power steering. I don’t know if that was due to the incident or not. Steven Doherty: “Nick and I had a rough day at Laguna. First-lap contact had us coming from the back after a puncture. Nick was making great time and we had worked our way back up to ninth when Lady Luck struck again with a failed alternator. The team did a great job fixing the car in the paddock and had us back out in less than an hour! “Nick took the wheel again, as he hadn’t made drive time. I jumped in with about an hour left. Shortly through my stint the bad luck stuck again, as the power steering had sprung a leak, leaving me with no power steering. We pulled in to top off the fluid but developed a misfire during the late stages of the race. Sometimes it just isn’t your day. I’m looking forward to the next one!